Send a Birthday Care Package filled with delicious birthday snacks, birthday plush gifts and more! All gifts in our Birthday Care Packages category are available for delivery to Overseas Military addresses (APO, FPO, DPO), (AA, AE, AP). Birthday Surprise Party Snacks Care PackageMake their birthday the biggest celebration of the year with our fabulous birthday surprise care package. 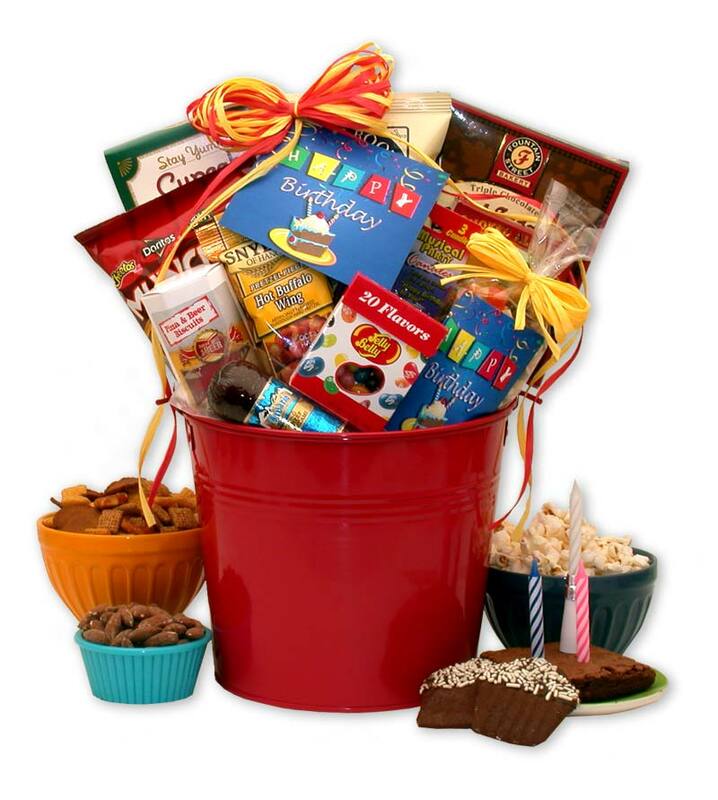 Just for your birthday star we've included Jelly Belly Jelly beans, fudge brownies, a birthday candle, and more. APO/FPO/DPO Shipping Available. Bright Birthday Surprise Gift PackageIncludes milk chocolate birthday candles, assorted gummy bears, "Happy Birthday" fortune cookies, butter crunch caramel corn, and more delicious birthday treats! APO/FPO/DPO Shipping Available. Beary Happy Birthday Gift BasketThis adorable bear sends special birthday wishes for that "beary" special person. An adorable glittering white teddy bear is surrounded by a sliced cake candle, and an assortment of delicious gourmet treats. APO/FPO/DPO Shipping Available.